Good morning everyone! I hope your weekend is going super! Ours is going way too fast! Thankfully we have tomorrow off and then it's back to school! Ugh! But what a great vacation we have had! I guess it will be nice to get back to a routine. So I didn't get any of the things done yesterday that I thought I would. I did get some other things accomplished which is good. But today I must do the laundry and get some stamping done! Today's card was inspired by the sketch at Cardabilities. When I saw the sketch I thought this set would work perfectly! 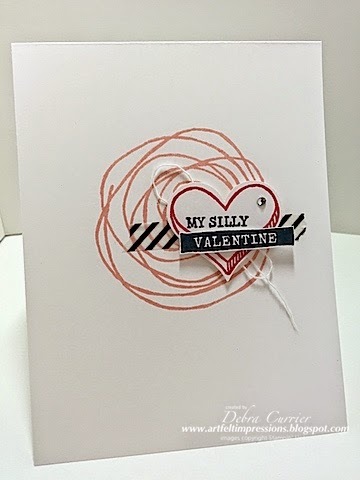 Just a fun valentine! Thanks for stopping by and have a super day! Very nice idea :) Thank you for joining wit us Cardabilities. Great card!! Loved! Thank you for playing with us! Cardabilities team!